While Bush’s Government builds what is purported to be the biggest diplomatic outpost on earth, Iraqi families suffer water shortages and power cuts and are forced to wait in line to fuel their cars. Although $22 billion has been spent, Baghdad’s infrastructure still operates at pre-war levels. Out of 150 planned medical centres only six have been completed. The failed $147 million programme to train Iraqi security units to protect key oil and power facilities is the subject of a current fraud investigation. Before the war oil production was 2.6 million barrels per day; now it is only 2.18 million. As an astonishing catalogue of missed deadlines and overspending on civilian building projects is revealed, the bill, so far, for ‘George W’s palace’ stands at $592 million. To add insult to injury the Kuwaiti contractor employs only foreign workers. The 104 acre site, protected by a 15ft thick perimeter wall, will comprise 21 buildings, to include luxurious residences for the ambassador and his deputy, six apartments for senior officials, office accommodation for 8,000 staff, a super-sized swimming pool, an olympic class gymnasium, cinemas, tennis courts, US food chain restaurants and a top drawer American Club for evening functions. And the USA retains ‘no long term ambitions’ here? Not surprisingly the size of the project is seen by Iraqis as ‘an indication of who actually exercises power in their country’ (and of who will no doubt continue so to do). For news you won’t find on Fox and CNN click here. A MOEBIUS STRIP REPRESENTS INFINITY. 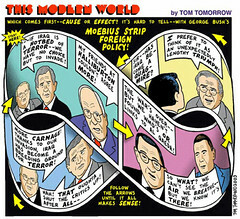 YOU GET A DOUBLE MOEBIUS STRIP (Afghanistan + Iraq). IF YOU CUT IT AGAIN YOU GET A TRIPLE STRIP (Afghanistan + Iraq + Iran) AND SO ON INTO INFINITY. WHEN YOU RIDE A MOEBIUS STRIP IT’S LIKE GOING BACK TO THE BEGINNING (Vietnam) IN SPACE ON A ONE-DIMENSIONAL SURFACE: YOU MUST CONTINUE AND CONTINUE AND YOU WILL NEVER CROSS YOUR STARTING POINT AGAIN. LIKE LIFE ITSELF IT IS A PERPETUAL RESTART, NEVER FROM THE SAME POINT. Yesterday (October 18) the session judge in the case of Mirza Tahir Hussain issued a fresh warrant for the Leeds man’s execution. According to Adiala jail authorities Mirza’s family were informed that he would hang at 06:30 am November 1st, a date which would have coincided with a visit to Pakistan by a member of the British royal family. Today, in response to a plea for clemency by Prince Charles, the man has been granted a further stay of execution (his fourth). He will not now be executed before 31 December. His brother Amjad, speaking to the BBC, expressed his anger at the decision: “Pakistan has no due regard for the representations that have been made. It’s like saying to my brother ‘Live to die another day’. It’s murder by a thousand cuts. Under article 45 of Pakistan’s constitution the President has the power to pardon mirza but has refused to do this, in spite of his self confessed doubts regarding the safety of the conviction. By not bringing the matter to a positive conclusion at this time, Musharraf throws away a timely opportunity to show the world that Islamic governments are capable of compassion and justice. Simply delaying the execution one more time is an act of terrible cruelty both to Mirza and his family. It seems the “terms” were not “certain” enough. I wonder how much more certain they would be if the man suffering the injustice was a white European. These are exactly the same tactics the Nazis used in WW2. They lost. In a few hours (October 1), British Time, it will be my birthday. It may also be the last day on earth for Mirza Tahir Hussain. It seems appeals to Pakistani President Pervez Musharraf during his presidential visit to Britain have fallen on deaf ears. Musharraf alone has the power to commute Mirza’s sentence but he “brushed past” demonstrators in Oxford today and refused to comment on the Leeds man’s case. “I, and the whole of the UK Liberal Democrat delegation, have been leading a European Parliament campaign to prevent what would be a gross miscarriage of justice. As time runs out for Mirza those words sound increasingly hollow. If I had faith in a supernatural God I would praying to him right now to intervene and save this man. Sadly, I have no such faith. I do, however, believe that Mirza will survive. Musharraf needs a “distraction” from a couple of “higher profile” issues at this time. Perhaps an act of clemency towards the man from Leeds will provide it? In August the Imperialist Bush neo-con administration and its associated “big 5” media corporations proudly proclaimed that Abu Ghraib prison had been emptied of detainees and was to be turned over to the “Iraqi government”. Well, it’s one thing to close a prison but quite another to release its inmates. So, what happened to them? Have you heard of Camp Bucca? What about Camp Cropper? Perhaps you have heard of the latter: it started off as a “temporary facility”, a “bunch of tents” appended to the US base adjoining Baghdad International Airport (which, incidentally is now one of the many “enduring camps” that have, since 2004, become fair-sized American towns, complete with Pizza Huts, Burger Kings and mini-golf courses) and is now a 60 million dollar state of the art prison. The emptying of Abu Ghraib may have made big news; the filling of Camp Cropper, however, didn’t get a mention. Currently the Bush administration, in the name of the American people and financed by their tax dollars — and, due to the complicity of our “leaders”, in the name of the people and courtesy of the tax Sterling of the UK — is holding 14000 prisoners in Iraq; possibly more that 500 in Afghanistan; and nearly 500 in Guantanamo. Most of these individuals are beyond the jurisdiction of any system of justice. And if all of the camps that we know about are shut down none of those prisoners is going anywhere closer to justice soon, because a globally outsourced penal system has been created to absorb them. If you don’t take the time to read Tom Engelhardt’s article you deserve what may be coming. To win a war you must first know your enemies. Click here to take that essential first step on the road to victory. Actually, I read it very closely with a view to doing just that but, as an atheist, concluded that there was really nothing to write about, except to say: listen guys, don’t worry about it, because, you know, THERE’S NOBODY THERE! Of course, they’re not going to fall for that one, are they — scientists and modern philosophers have been telling them the same thing without avail since the Enlightenment. Fact is, they want to believe it, don’t they? And that’s fine: I have no problem with other people’s beliefs, even though, in my opinion, religion — any religion — is the ultimate sting. I think: let them be stung. So look, I have to tell my friend to forget about the Pope thing. To my Muslim friends (I have many and they know and respect my views, which is more than I can say for the few Christians I count as friends) I say, if the Pope’s speech upset you, forget it, take strength from your faith, ask yourself: can words, or cartoons for that matter, harm the Prophet? Outside of friendship, as a secularist, what I say is that everything, faiths and deities included, is, in a secular society (which accurately describes the society I live in, although sometimes it seems that I’m the only one in it) open to discussion and sometimes criticism. And if that strikes you as simplistic and dismissive then you’ve got my view on the subject nailed to the cross (sorry, couldn’t resist that one). Because the whole “faith” thing, although it doesn’t hold scientific water, is in a very real and dangerous sense water-tight: If you’re a secularist and you’ve ever tried arguing the non-existence of a supernatural God with a Christian or a Muslim or a Jew you’ll know exactly what I mean. You can’t do it, can you? Because faith precludes reason: “well, look, you can say what you like but I know God exists because I believe he does”. What the Pope said about Islam was that it is incompatible with reason, because some medieval Christian bigot said it was a faith of violence. The pot calls the kettle black and, while they’re arguing about it, the water goes cold. The main agenda of the speech, however, wasn’t about about Islam versus Christianity. It was about the war — and by that I mean the very real conflict — between faith and reason, between religion and secular humanism.